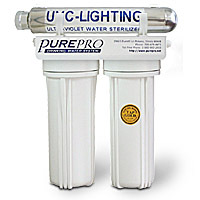 One inexpensive and efficient way of disinfecting the water supply is by irradiating it with UV light. It's known that UV light of wavelengths between 250 and 270 nanometers (UV-C or UVC band) is extremely effective in killing many species of bacteria, mold spores, viruses and other microorganisms. *Every five minutes, 630 children die from drinking dirty water. *Contaminated drinking water kills 3.8 million children per year. *People in most countries don't have the luxury of safe piped water. *A typical family spends 2 hours per day to boil the water for drinking. *No longer fear drinking water from your own faucet! *With carbon filter can eliminates the 17 hazardous metals from your water. 3 Stage UV Filtration System. 1.0 gallon / 3.8 liters per minute. Feed water connector or self piercing saddle valve. Private labeling are very welcome. Production: 1 GPM / 3.8 liters per minute.